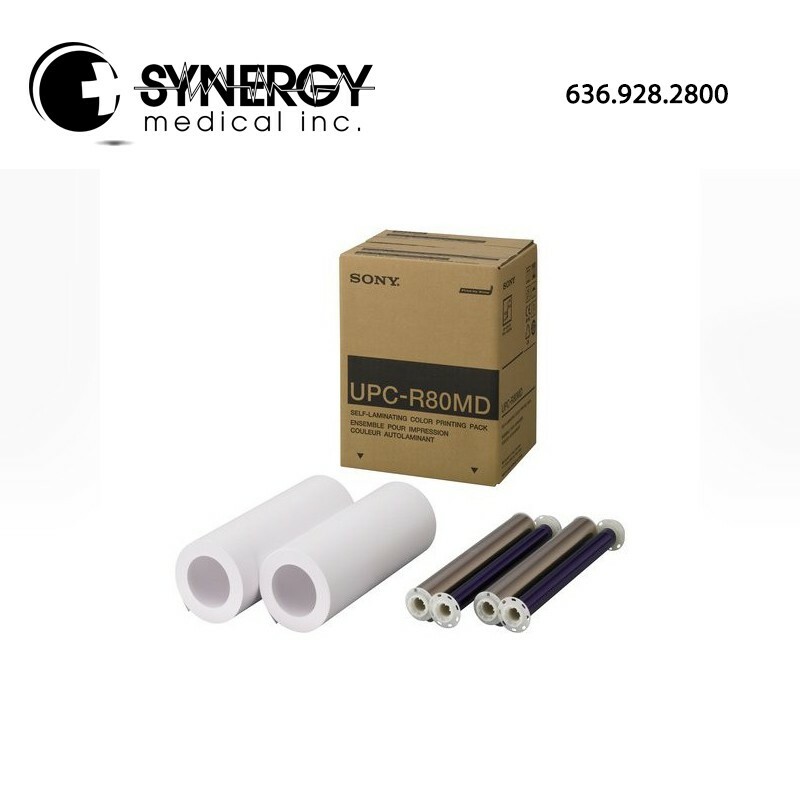 The Sony UPCR80MD (UPC-R80MD) A4 color print pack is designed to be used with the UP-DR80MD Sony digital color printer. Self-laminating, curl free media for ultra high durability and longevity. The protective laminate coating on the color print pack is resistant to light, heat, water, humidity and fingerprints. Long-lasting prints for long-term storage. 1 Box = 2 Rolls of paper & 2 Ink rolls, 1 Case = 4 Boxes. A4 is the standard size of typing paper adopted by the International Standards Organization. It measures 210 mm wide and 297 mm long (about 8 1/4 x 11 3/4 inches). It is used in most countries of the world, except the US and some neighboring countries where letter-size paper (8 1/2 x 11 inch) is used. A4 print pack to be used with UP-DR80MD. The UP-DR80MD operates at high speed. Printing an A4-sized image takes approximately 76 seconds. The UP-DR80MD produces photo-quality prints. It also employs Sony’s laminating technology, which coats each print with a protective layer that’s resistant to light, heat, water, humidity, and fingerprints. This laminating technology allows the prints to be placed in long-term storage without fear of degradation. The UP-DR80MD can print onto two different sizes of paper: A4 (297 x 210 mm, 11 3/4 x 8 3/8 inches) and Letter (279 x 216 mm, 11 x 8.5 inches). The front-loading operation makes it easy to replace paper and ribbon, and allows the UP-DR80MD to be installed in even the tightest of spaces. This useful design feature also allows you to use the printer on-cart. The optional UPA-WU10 Wireless Print System allows cable-free connection between the UPDR80MD and surgical endoscopes, ultrasound systems, and other hospital imaging modalities. This is ideal for busy clinical environments, where modalities are constantly being moved between different OR and treatment rooms. This all-in-one wireless printing solution also resolves the problem of limited space on medical carts, allowing connection between a medical imaging modality and an ‘off-cart’ printer without requiring a lengthy USB cable. *This function is available to UP-DR80MD with USB 5V Output port, manufactured in 2016 or later. Regarding the compatibility, please contact your nearest Sony office or an authorized dealer.